A Good Goodbye is an entertaining and educational weekly 60-minute online radio show on “everything you need to know before you go.” The program airs live on Wednesdays at 6:00 p.m. ET / 5:00 p.m. CT / 4:00 p.m. MT / 3:00 p.m. PT online. Each show becomes available as a podcast shortly after each live program. All past program podcasts on A Good Goodbye radio can be downloaded for free from iTunes and AGoodGoodbye.com. A Good Goodbye covers a wide range of critical information most people don’t consider until there’s a death in the family. 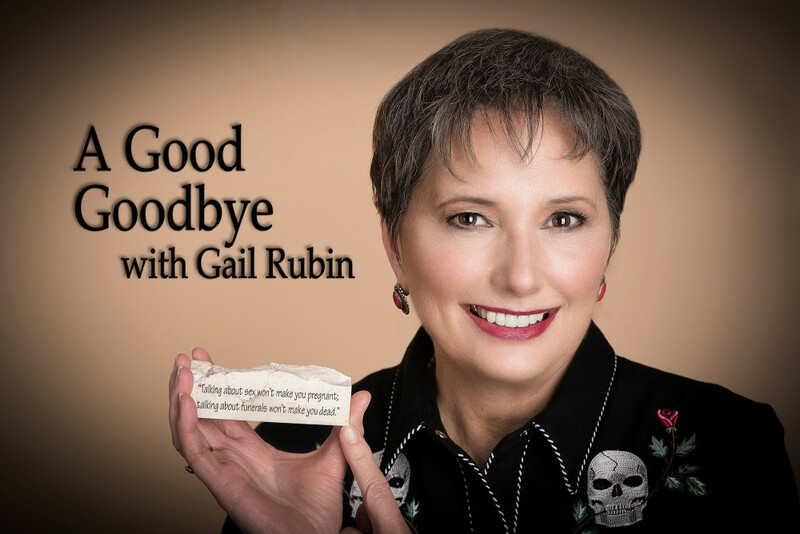 Host Gail Rubin brings a light touch to a serious subject and presents expert interviews on funeral planning issues with practical insights into the party no one wants to plan. Gail Rubin, The Doyenne of Death®, is author of the award-winning book, A Good Goodbye: Funeral Planning for Those Who Don’t Plan to Die. Host of A Good Goodbye television series and Internet radio show, she is also a Certified Celebrant, funeral planning consultant, insurance agent and a popular speaker who uses humor and films to get the funeral planning conversation started. Rubin is a member of the Association for Death Education and Counseling and the International Cemetery, Cremation and Funeral Association. She is Vice President of the Jewish-Christian Dialogue of New Mexico, helping to start conversations across religions. Her website is www.AGoodGoodbye.com.